16-level in rebump side and 16-level with H.B.S. Click here for TYPE Gr.N Damper brochure. While existing shock absorbers use bump rubber made of rubber/urethane to respond to input at full-bump, TYPE Gr.N Damper uses "H.B.S." which is controlled by a hydraulic system. "H.B.S." is controlled separately from damping force adjustment, thus it won't have a negative affect on traction performance and capability on flat surfaces. 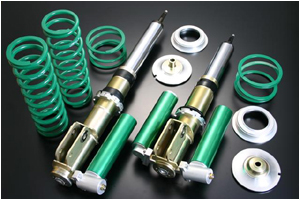 Unlike existing dampers, you don't need to unnecessarily set spring rates high and/or damping force stiff to accommodate big jumps, risking traction performance and control on flat surfaces. Likewise, you can avoid settings just for flat surfaces, which might cause unwanted movement during big jumps. 16-level damping force adjustment is also available with "H.B.S. ", to meet various rough and poor road conditions. A newly developed valve, placed at the oil bypass of the damping force adjustment mechanism, generates adjustable damping force in micro speed range. Use of M.S.V. secures sufficient damping force even with the knob set to a softer position, thus improving steering response, road ability and traction performance effectively in any damping force range. Gr.N Damper has a separate reservoir tank for increased oil capacity, in order to generate stable damping force even for long distance SS. Front shock absorber for Gravel has dual reservoir tanks. This structure enables to secure sufficient oil amount and promote efficient heat release. 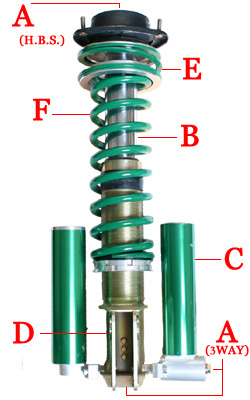 Exclusive, large-diameter helper spring is used on strut type suspensions. When the main spring strokes, it enters inside a wide helper spring. This eliminates "dead" stroke occurring when the spring is pressed, thus enabling to secure maximum stroke. 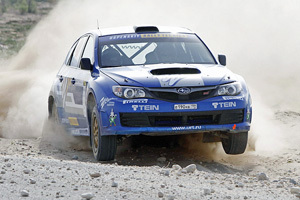 For long distance SS, such as in WRC, the workload of the shock absorber oil is tremendous, causing temperatures to rise close to 150°C. In such cases, viscosity of oil declines and thus damping force generation drops. T.C.V. compensates for the decline in damping force, due to oil temperature rising, to provide continuous linear damping force.